The windows software alphaSOFT features the remote control of the portable hardness tester alphaDUR. 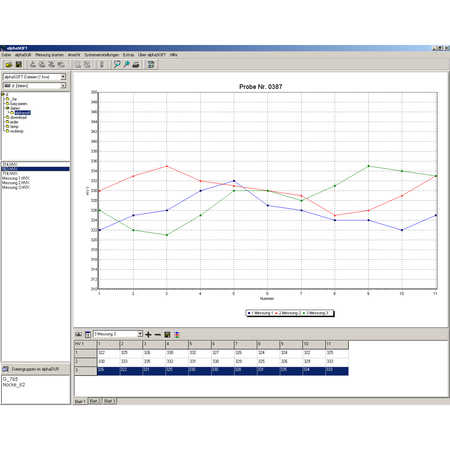 alphaSOFT provides the graphical analysis of the readings and facilitates the creation of test reports. The readings will be transmitted to the PC and can comfortably be analysed and managed. • Setting of the alphaDUR measurement paramete . • Storage of con gurations of measurement parameter on the alphaDUR or on the computer. • Loading and deletion of measurement parameter configurations stored on the alphaDUR or on the computer. • Correction of measurement data is possible at any time. During recording of measurements selected readings can be deleted. Software in german and english language. The language can be choosen at runtime.